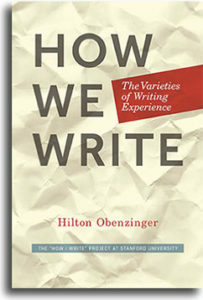 How We Write: The Varieties of Writing Experience is based on the series of “How I Write” public conversations with faculty and other advanced writers conducted by Hilton Obenzinger at Stanford University since 2002. These conversations explored the nuts and bolts, pleasures and pains, of all types of writing. “How I Write” conversations were informal, with no pretense of plumbing the depths of anyone’s scholarly expertise or art, although much was revealed. Rather, these talks probed what the writing part of these scholars’ and artists’ work entailed—whether their field was physics or anthropology or fiction—in an easygoing fashion. Participants included such authors as Pulitzer Prize-winning novelist Adam Johnson and historian David Kennedy, physicist Leonard Susskind, poets Evan Boland, Gwyneth Lewis, and Diane di Prima, literary critics and biographers Arnold Rampersad and Diane Middlebrook, novelists Abraham Verghese, Valerie Miner and Irvin Yalom, playwrights David Henry Hwang and Amy Freed, philosopher Richard Rorty, historian Ian Morris, environmental scientist Terry Root, cultural critic Rebecca Solnit, anthropologist Renato Rosaldo, and neuroscientist Robert Sapolsky.